It’s prime time for picnic season, and we’re reviving one of our most popular features — Chambana Parks to Know — just in time. If you have a park that you’re crazy about, we’d love to know all about it. We’ve put together an easy form for you to use! We look forward to your Park to Know contributions. LOCATION: Bordered by W. Charles to the south, To get there, take Prospect Ave. to William, and turn west. You’ll run right into the park. Here’s a link to Google Maps. AMENITIES: Basketball court, Tennis courts; picnic area; tons of playground equipment; sand volleyball court. 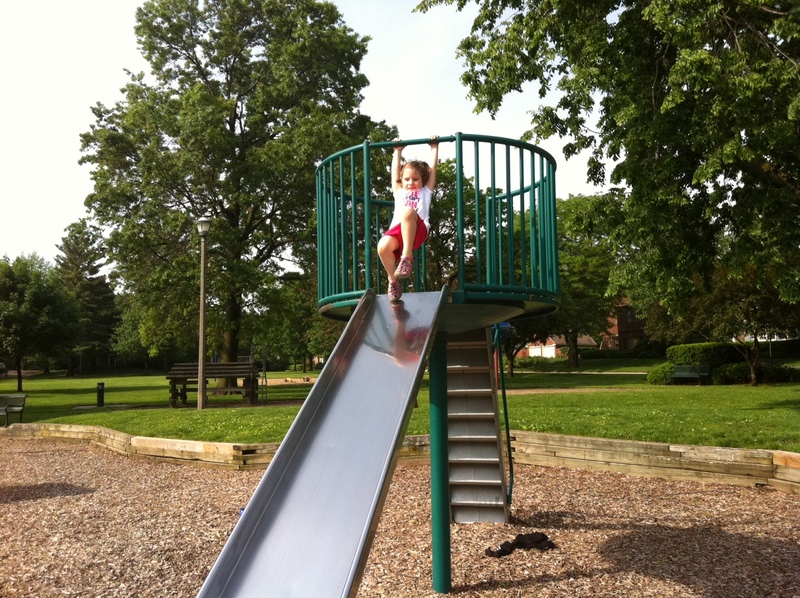 LAURA’S TAKE: Clark Park is a slice of Americana. Surrounded by beautiful older homes with lush gardens, it feels like you’re taking a step back in time. It’s obvious that Clark Park residents take great pride in their park, a rectangle surrounded on all sides by homes and residential streets. And it’s obvious that the park is well-loved and well-cared for. One of my favorite things about this park is its community feel, which you gather immediately from the sand toys left around the clock in the sandbox. An old park with old trees, there’s plenty of shade. I also love the variety of playground equipment here. It’s fun to watch the girls climb up the old-school slide and come whipping down. They really like the “zip line” feature on the newer playground. They also enjoy exploring the wooden house-like structure and making up stories and pretending. There’s a small merry-go-round-like piece of equipment, and also a funnel ball, so bring some balls with you. This park is good for a variety of age groups because there is literally something for everyone — the bigs and the littles. Clark Park is one of the most sought-after neighborhoods for Champaign home buyers, which is reflected by the fact that it has one of the highest costs per square foot of any housing area in the city. Although its vintage houses may not be the biggest, you’ll pay more for them. Tell us why you love Clark Park!